Keep your tackle in tip-top shape and it won't let you down. If you live in the wintery, snow stricken corners of the United States, you probably spend your winters like many house bound anglers do; thumbing through fishing magazines, watching fishing shows and waiting for the first robins to appear in the back yard. If you still have a few bucks in your bank account after the holidays maybe you’re planning a week long getaway to catch a few bonefish in the Bahamas, just to relieve the itch. If not, a good way to spend those winter evenings is getting your tackle ready for springtime on your home waters. Let’s start with the most complex part of the anglers tackle arsenal, the fishing reel. Generally speaking, maintaining a reel is a very simple process that is often overlooked by anglers for fear of not being able to put the mechanism back together again. Often times, simple maintenance of the exterior of the reel will prevent problems from occurring within the interior of the reel. Dirt and debris moving from the outside to the interior causes 90% of the problems with gears and bearings. Start by removing all dirt, film and debris from the reel housing using bottled reel cleaner or warm water with a drop or two of dishwashing soap. An old toothbrush can aid in cleaning tight areas and scrubbing off dried algae, salt and blood stains. Be sure to clean debris out of the connection point where the reel knob meets the handle. Dirt buildup in this location will often times make the reel feel very rough and unbalanced. Simple routine maintenance will keep your gear working properly and it will last longer. 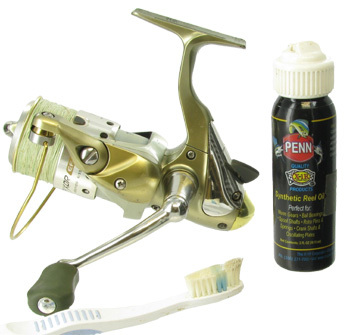 Once dried, select an oil that is made specifically for reel lubrication. A drop or two goes a long way so don’t over lubricate. Be sure to get the reel knob, the bail trip arm and the roller bearing on the bail itself. Crank the reel handle to work the new oil in to the reel knob and flip the bail a couple times to spread the oil out. If the reel still feels rough you may need to venture inside the gear box to remove any accumulated debris. Learning to follow a reel schematic can help you to save money from pricey reel repairs but if you lack the confidence, have your reels maintained once a year by a professional. Moving on, the fishing rods are the next in line for maintenance. Start again with a warm solution of water and soap and work on removing dried algae and salt. Clean the entire rod blank and all of the guides and rings. Wipe them down again with just water to remove any soap film. Examine the guide rings for any cracks that may abrade your fishing line. To be extra sure that your guides are in perfect shape, wipe a cotton swab around the inside of each guide ring. Any chips or cracks will grab the cotton fibers from the swab leaving a tell-tale sign of any damage. Clean the threads of the reel seat with a toothbrush to insure that the tightening ring will secure your reel properly to the rod. Monofilament lines must be replaced every season, if not more than once a season, depending on your angling frequency. Monofilament weakens over time with exposure to sunlight and it also retains too much line memory when left coiled on a spool for months at a time. Braided lines will often last more than just one season but really examine the first 20-30 feet of line to be sure that you have complete confidence in it. One option for getting the most of your braided line is to strip the line off the spool and reverse it when re-spooling so you will now be using the previously unexposed fishing line. Trying to organize the tackle bags and boxes is an ongoing task. We all struggle with it and are always searching for the next best way to keep things neat and tidy. The best thing you can do is to try to start from scratch again. Empty everything. The bags, the boxes, the bags within the boxes, etc. Go through all the lures and decide which ones go and which ones stay. Prioritize with what you really need to have with you and eliminate the stuff that you’ve just been carrying around with you for the past couple years. Clean the interior of your bags and wipe down your plastic boxes to get rid of any dried salt. After organizing the rest of your tackle, the best option that you have for keeping your tackle tidy is summed up in one word: vigilance. Try to take a few minutes every week to go through any tackle you have been using and make sure everything is in the order it should be in. Wipe the salt off those boxes before it starts crusting up and falling to the bottom of your tackle bags. Replace a rusty treble hook on one lure and you may help prevent further corrosion of other hooks and lures in the same box. A few minutes of tackle maintenance every week for the avid angler can help avoid all kinds of problems while out on the water. And, avoiding costly repairs with simple maintenance can save you money and a lot of hassles. It can also save you a lot of time on that long, wintry night when you decide it might be a good time to get your tackle ready for the spring.